Nostalgia was named and identified as a medical condition in the 17th century by a doctor who saw a lot of Swiss soldiers grow ill and melancholy from being so long away from their childhood regions (he called it “Swiss illness”). Now it’s generally understood to mean a longing for the past, a longing to be back somewhere that is idealised and has passed away forever. I have been feeling nostalgic this week, out of nowhere: it’s not something I often feel. But this week marked the passing away of something very simple and very significant. My daughter finished kindergarten on Wednesday, and so Thursday and Friday this week were our last mummy-daughter days before she goes to school next year. Yes, we have holidays now for six weeks, but her brother will be here too. Those special precious times where it was just my baby and me are over forever. I saved all my running-about-town chores for Thursdays and Fridays, because she loved so much coming shopping with me, and going to Medicare, and the physiotherapist, and so on. She loved just being one of the girls with me. This is not to say we can’t have those fun times with my son about: of course we can. But it’s a different dynamic. This really was the last week of her babyhood. She’s five now. 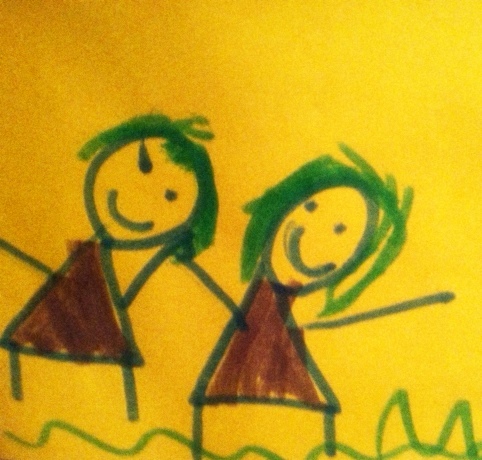 Old enough to draw pictures like the one above of us, in matching purple dress, that she gave me after we had a fight this evening (she stole a forbidden biscuit then smooshed it into the ground rather than putting it back in the biscuit box). The strange thing about this week, though, is that it has aroused all these feelings and memories in me from my own childhood. I remember being in Astrid’s position. I loved to go to the bank on the bus with my mum, on those special days when it was just her and me while my older brother was at school. I can remember so clearly the string bag she had for her shopping, how she would ask the bus driver for “one and a half” fares, i remember being so excited if she let me pull the bell ringer before our stop. These memories are flowing back to me in rolling waves and filing me with beautiful, achey nostalgia. I’m gorging on it even though it’s making me sick. I don’t know how my little girl will remember her early childhood, but I hope that one day she will remember walking to the postbox with me and remember it fondly. Because I will remember it fondly. Her soft little hand in mine, her happy chatter, her rosy cheeks and tiny teeth. I will never forget it. You gotta love the whole peace offering thing.